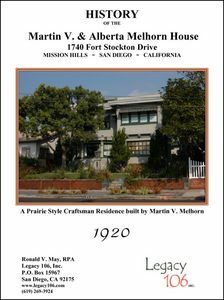 The Martin V. and Alberta Melhorn House is a distinctive historic, two story, 1920 Prairie style Craftsman residence in Mission Hills, San Diego. A product of the late Arts and Crafts Movement, this house exhibits all the grandeur of a prominent upper class house with a third floor “airplane” observation room that commands a striking view of Sunset Drive and Fort Stockton Drive to the west. Master Builder Martin V. Melhorn created this house during his era of independent design and construction, following dissolution of the Bay City Construction Company in 1916 and the death of his former partner, John J. Wahrenberger. Melhorn experimented with Prairie style and stucco finish architecture during the 1916 to 1922 period and this house is a classic example. He and Alberta Melhorn relocated into the house in 1920 and they lived there until 1922 when they moved nearby to Hawk Street. The house is important for three reasons. First, it contributes to understanding Master Builder Martin V. Melhorn’s independent building and design skills that he developed between 1916 and 1922. After dissolution of the Bay City Construction Company in 1916, Melhorn had the opportunity to experiment with designs and building materials that his former partnership had not attempted. During this era, Melhorn created a body of works that encompassed both residential and commercial structures. He left a legacy of built structures in Mission Hills that helps define the character of the community. 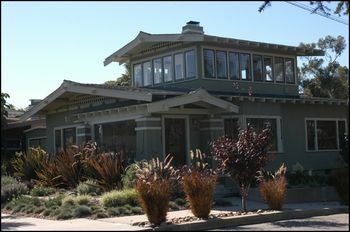 Second, the house is important simply for its architecture, as it is an excellent example of a Prairie style Craftsman with an airplane observation room on the roof. Third, it contributes to the cultural landscape of the Fort Stockton Trolley Line through a better understanding of the residents who lived in the house through the historical period. Some time between 1880 and 1895, he and Alberta Abell married and they had a son, William, in 1895. Although the mechanism of their bond is not yet known, Martin and Alberta Melhorn knew fellow carpenter John J. Wahrenberger while in Denver and when he came to San Diego they became business partners. Wahrenberger family lore has them in San Diego as early as 1910, a year earlier than the Melhorn’s arrival. 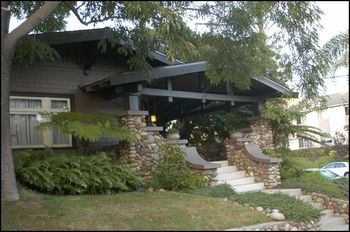 A number of William Wahrenberger’s homes in Mission Hills are now City of San Diego Historical Landmarks. His father’s work, however, has not been studied and as yet is unexplored for its relationship with Martin Melhorn and the Bay City Construction Company. Collage of Hieatt bricks in garden near Texas and Upas Streets, north of Balboa Park. In 1909, Forrest L. Hieatt acquired all of Block 14, with Lots 1-10 inclusive. Hieatt was a director of the Mission Hills Company and he purchased and sold lots throughout Mission Hills in this period. He and his wife Alla operated a real estate firm at 918 6th. He also worked as a real estate auctioneer. Another major component to his investments was the F.L. 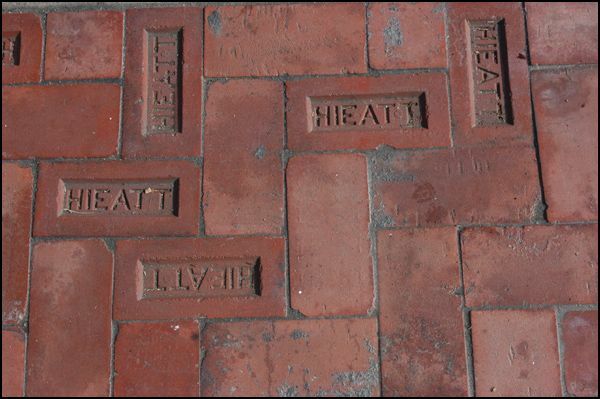 Hieatt Brick & Tile Company, which he owned and operated at California and Laurel in Middletown. His brick company produced fired brick, hollow fired clay building tile, and other masonry construction materials used in residential and commercial construction. Some of the bricks from his company can still be found in gardens in the neighborhood, as can be seen on Texas Street near Upas and the northern rim of Balboa Park. He and Alla owned lots on Lyndon Road, Sheridan, Fort Stockton, and W. Lewis Street. Martin Van Melhorn and his wife Alberta brought their family to San Diego from Denver, Colorado in 1911. Melhorn was born some time in 1866 to German immigrant parents from Wurtemburg, Germany (1920 U.S. Census). The 1880 U.S. Census shows he was age 15 boarding with James P. and Sarah E. Tarpley in Fall City, Nebraska. The next record indicates he had moved to Denver where he was involved real estate and worked as a carpenter. To date, no one knows what buildings he built in Denver. Like Forrest Hieatt, Melhorn also bought property by the block in the early years of the Mission Hills subdivision’ development, in addition to scattered individual lots. His earliest residential work involves Block 59 of the neighboring Arnold & Choate’s addition, just a few blocks east of the intersection of Sunset and Fort Stockton Drives. Bay City Construction Company bought the block in 1911 and proceeded to build out all the lots between 1912 and 1915 in the Craftsman style. Martin Melhorn shifted from the carpentry-oriented Craftsman style to greater use of stucco in Prairie style houses after 1916. He often designed two story houses with wide windows and broad horizontal visor overhangs that shaded the upstairs windows. In 1918, Martin V. Melhorn began construction on this house, which differs remarkably from the earlier homes he had been building in the neighborhood. In design, scope, and materials it represents the completely new phase of his body of works in residential construction. 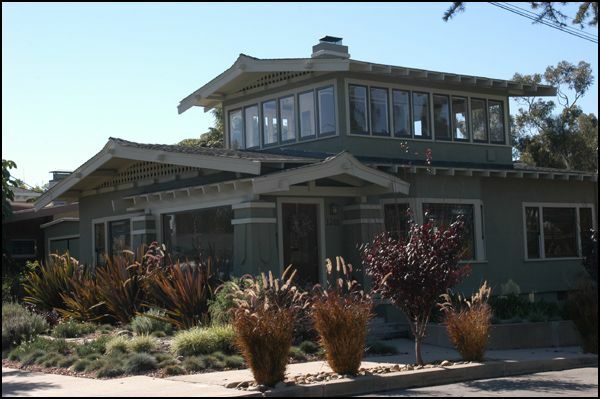 This Prairie style Craftsman house has an entirely stucco exterior with an overhanging roof supported by heavy brackets. Each of these designations represents a different point in Melhorn’s career, as he evolved through a series of three companies that he owned between 1911 and 1925. 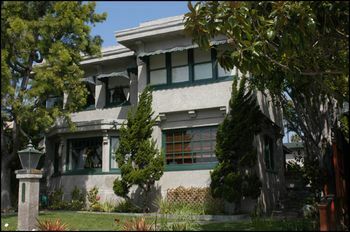 Martin and John joined with San Diego realtor John C. Rice on July 1, 1911 to incorporate as Bay City Construction Company. Melhorn, Wahrenberger, and Rice each owned fifty shares of the company. The discovery of John Clinton Rice’s involvement with Bay City Construction Company is interesting because of his own family and work. 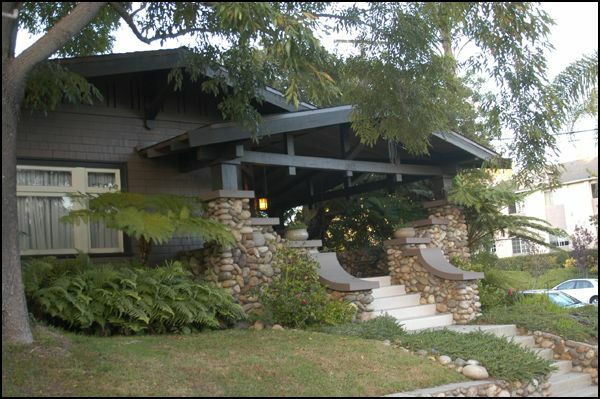 His sister was Lillian C. Rice, a Master Architect well known for her architectural work in Rancho Santa Fe. His wife, Miriam, was a grand daughter of President Ulysses S. Grant. These connections and his own business savvy no doubt helped him in his work a realtor in San Diego and surrounding cities. He was an all around sportsman in golf, marksmanship and drove racecars with the famous Barney Oldfield. Rice also served as president of Rice-Landmark Company in 1911 with an office in the U.S. Grant Hotel. Previous studies have been unable to determine the date that Martin Melhorn died. A recent discovery of his probate records, however, reveals that he passed on August 17, 1925. At the time of his death, Melhorn had at least forty houses and commercial buildings were under construction. Each of these phases represent distinct philosophies, architectural design, and architectural products. In essence, the Arts & Crafts style Craftsman, Prairie style Craftsman, Spanish Eclectic, Art Deco style, and Mid Century Modern styles are all extinct and no longer produced by the current company. The selection of materials, available hardware and appliances, and sense and feel of those old buildings no longer exists in the 21st century in new construction. For all of these reasons, the house at 1740 Fort Stockton Drive is an important work by Master Builder Martin V. Melhorn.